How to Live Stream to Multiple Destinations at Once: What is Simulcasting? This post talks about how to send your live stream to multiple destinations including your website, Facebook Live, YouTube, Periscope (Twitter), AppleTV, Roku, Amazon Fire TV, Chromecast, and mobile apps. The post is part of our series on How to Start Live Streaming. Simulcasting is the name for live streaming to multiple destinations—your website, social platforms, mobile apps, smart TV apps—simultaneously. In context, if you live stream video to your website and YouTube at the same time, we would say you are, simulcasting your broadcast to two destinations. Not long ago, if your organization wanted to live stream, you only had a few destination options. 1. You picked a CDN to distribute your content around the world and an embedded video player to show that content on your website. 2. You sent your stream to a third-party website to host the video player. You told your viewers to go to that external website to watch. Both of the old methods were clunky and expensive. Over the last few years, the landscape dramatically changed. Live streaming is now social. Facebook Live, YouTube, Periscope (Twitter), and other platforms empower easier promotion and engagement. Instead of bringing your followers to your live stream, with social streaming, you can bring your live stream to your followers. Embedding live streams on your website continues to be a great way to grow your presence and brand. But with the power of social destinations, you can—and should—reach your followers across other platforms. Unfortunately, making one thing easier made another more difficult. The many live stream destinations created a painful process for broadcasting. Since each of the live streaming destinations wants you to send your stream their platform only, they created no functionality to push the stream to other locations. Alone, simulcasting would have been too exhausting, error-prone, and network-draining for most organizations that stream regularly. If you're streaming multiple events week-after-week, it's important to create a live streaming setup that's easily repeatable. At BoxCast, we simplify simulcasting setups by allowing you to schedule a broadcast with as many destinations as you need with a single click. You can save time and plan ahead by scheduling broadcasts days or weeks before you go live. 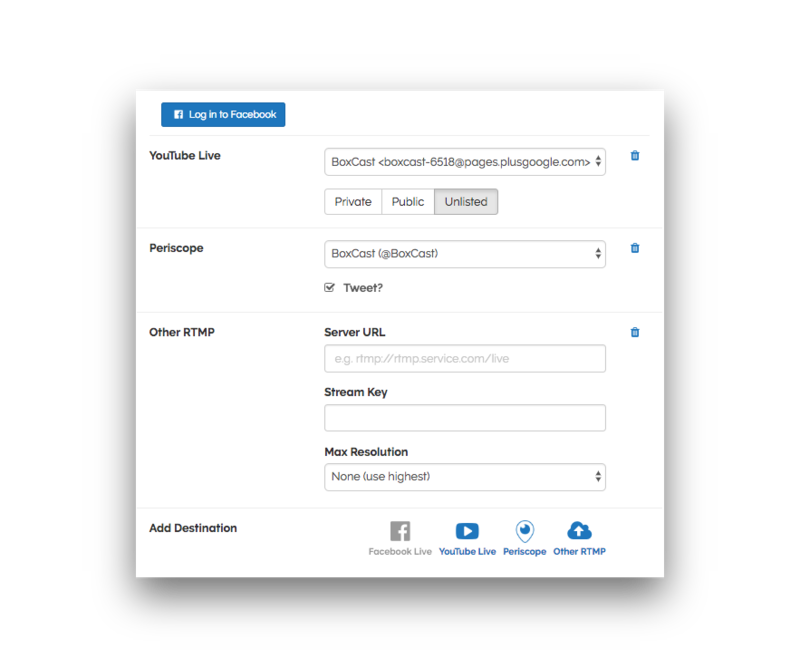 The BoxCast Platform also lets you set recurring broadcasts and upload your events in bulk. We handle the process, so you can focus on creating a beautiful experience for your viewers. Note: Due to a newly enforced Facebook Platform Policy, you must choose to either simulcast to Facebook or simulcast to other live streaming services like YouTube, or Periscope. You can still stream simultaneously to multiple Facebook Pages. The most critical factor in the performance of a live stream is your network connection. The amount of bandwidth you have can limit your ability to stream a consistent, high-quality stream. If you simulcast to different destinations separately—as in the example below—you overload your network unnecessarily. For example, if your stream requires 4 Mbps upload and you are sending it to four different destinations separately, it needs 16 Mbps to send the stream to each location at the same time. 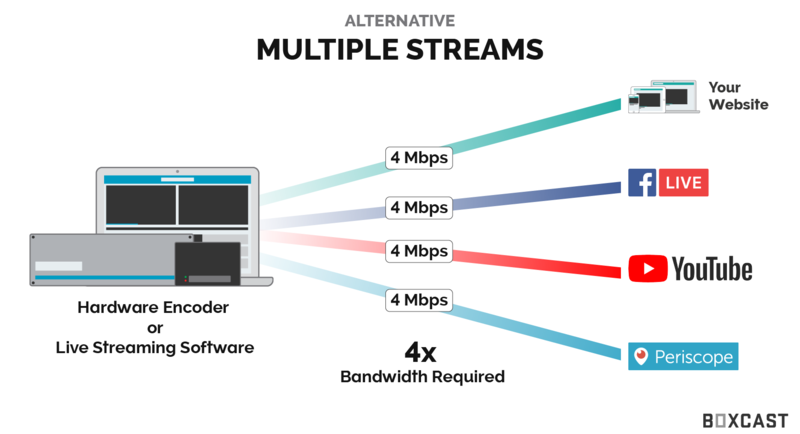 Your network may not have the capacity to send all of those streams reliably. 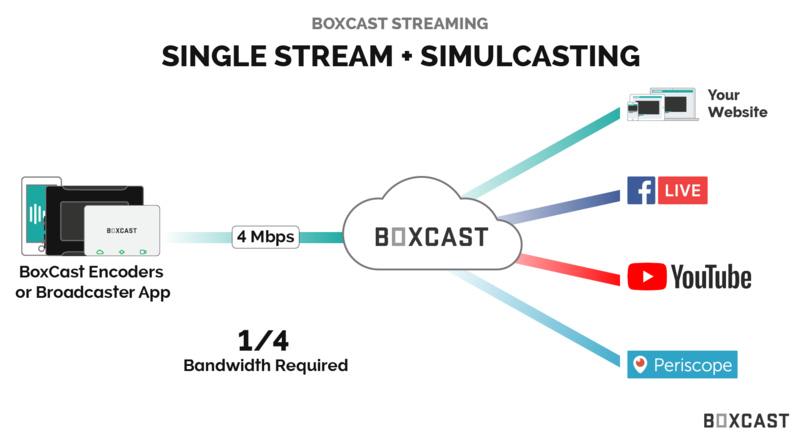 The BoxCast Platform eases the bandwidth strain of your simulcast. With BoxCast, you don't have to send the streams to four locations separately over your internet. Instead, your network sends one feed to the cloud. From there, we take care of distributing it to each of the destinations. You'll be simulcasting to all the same places with one-quarter of the bandwidth requirements. Simulcasting is a key part of the live streaming for organizations. If you aren't sending your broadcast to multiple destinations, you are missing out on viewership. The BoxCast Platform helps you simulcast your broadcast to all the destinations where your viewers might be. Here's how the Cleveland International Film Festival increased their viewership by 760% by simulcasting.